(NEW YORK, NY) Environmental Defense Fund President Fred Krupp today announced plans to develop and launch a new satellite purpose-built to identify and measure methane emissions from human-made sources worldwide, starting with the oil and gas industry. 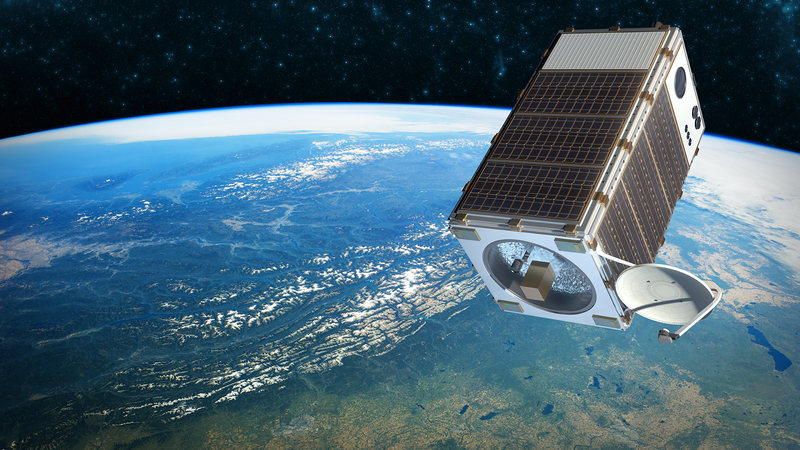 Data from MethaneSAT is intended to give both countries and companies robust data to spot problem areas, identify savings opportunities, and measure their progress over time. Krupp unveiled MethaneSAT in a TED Talk at TED’s flagship event in Vancouver, British Columbia, as part of The Audacious Project, successor to the TED Prize. MethaneSAT is part of the inaugural round of world-changing ideas for which a coalition of philanthropists have contributed and helped raise $400 million and counting. MethaneSAT is the newest chapter in EDF’s ongoing effort to advance peer-reviewed science focused on oil and gas methane emissions. A high-resolution photo rendering of MethaneSAT is available here. Methane is a powerful greenhouse gas; emissions from human activities are responsible for a quarter of the warming our planet is experiencing. The oil and gas industry is one of the leading sources of human-made emissions, releasing an estimated 75 million metric tons of methane into the atmosphere each year – enough gas to generate electricity for all of Africa twice over. Simple, cost-effective steps can cut these emissions dramatically. The International Energy Agency estimates the industry can feasibly reduce its worldwide emissions by 75 percent – and that up to two thirds of those reductions can be achieved at zero net cost. MethaneSAT will involve significant advances on existing technology, in both the design of the instrument on the satellite and the data processing solutions necessary to turn its vast stream of raw data into actionable science that oil and gas companies, governments, investors and others can use to shape and evaluate emissions reduction strategies. To get the project off the ground, EDF has hired Tom Ingersoll, a successful satellite entrepreneur with three decades of experience. Ingersoll was previously CEO of Skybox Imaging and Universal Space Network, a global satellite ground-station services company. He started his career in the PhantomWorks of McDonnell Douglas Corporation, where he led advanced technology projects in satellite and rocket systems. Work on the mission is well under way, with the goal to lift off in late 2020 or early 2021. EDF has partnered with Harvard University and the Smithsonian Astrophysical Observatory to complete the basic science and technical strategies for the mission, and expect to complete final mission requirements and set a launch schedule later this year. These critical early stage efforts were made possible by support from the Robertson Foundation. MethaneSAT is designed to measure areas of interest with a level of precision not previously available. It will use a wide, 200 kilometer view path at intervals of seven days or less, making it feasible to regularly monitor roughly fifty major oil and gas regions accounting for over 80% of global production. MethaneSAT will also be capable of measuring emissions from feedlots, landfills, and other man-made methane sources. The project defies current paradigms in orbital detection. Most satellites originate either from research and space organizations as large-scale projects requiring multi-purpose platforms, or from private sector ventures selling data to corporate and government users. MethaneSAT combines the economic advantages of each model. As a core part of the project design, EDF plans to make MethaneSAT data available for free to stakeholders and the public, engagingthe oil and gas industry, key governments, institutional and individual investors, and regional and global institutions to ensure sustained long-term data analysis and integration of the results into their thinking on emissions mitigation and verification. EDF has organized an extensive and influential body of scientific work on methane, including a five-year, $20 million series of studies involving more than 140 researchers from over 40 institutions, examining every link in the U.S. oil and gas supply chain. The research, which has generated 35 peer-reviewed scientific papers, shows that emissions are significantly higher than previously estimated. EDF has also examined the industry’s emissions in Canada and Mexico. EDF has also engaged with ten oil and gas companies representing 20% of worldwide production that together formed the Oil and Gas Climate Initiative (OGCI) around methane issues, and worked with governments and industry to catalyze the Oil and Gas Methane Partnership (OGMP), a coalition of eight global producers committed to better reporting to reduce methane emissions. EDF, OGCI, and the Climate and Clean Air Coalition (CCAC) are collaborating on a series of new peer-reviewed studies to measure oil and gas methane emissions in key locations across the globe, which will complement the data collected by MethaneSAT.